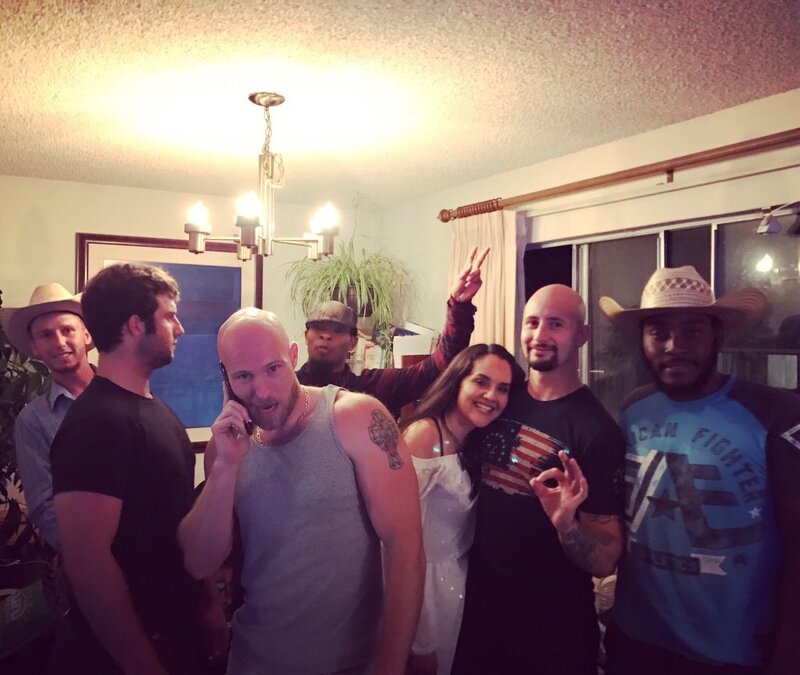 NoCARA recently received an anonymous submission of documents disclosing communications as well as a meeting that took place between Berkeley City Councilman Ben Bartlett, conservative activist Ryoga Vee, and Bay Area Proud Boy Jarod Flores. This news comes at a time when Councilman Bartlett is under fire for abusing his authority on multiple occasions in order to avoid traffic tickets, and the Berkeley City Council and Berkeley police are facing backlash from the community after Berkeley PD doxxed counter protesters opposing a far-right rally in MLK Park on August 5. While the records we received don’t comprehensively lay out the exact contents of the meeting Bartlett had with Ryoga Vee and Jarod Flores, we believe the timing of their communications and additional comments elsewhere by Vee provide insight and context into what happened and why. A link to the original PDF we received can be found at the bottom of this article after the analysis below. 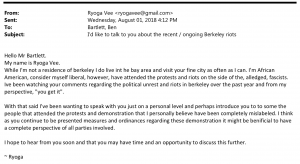 Last month on August 1, Ryoga Vee contacted Berkeley City Councilman Ben Bartlett. 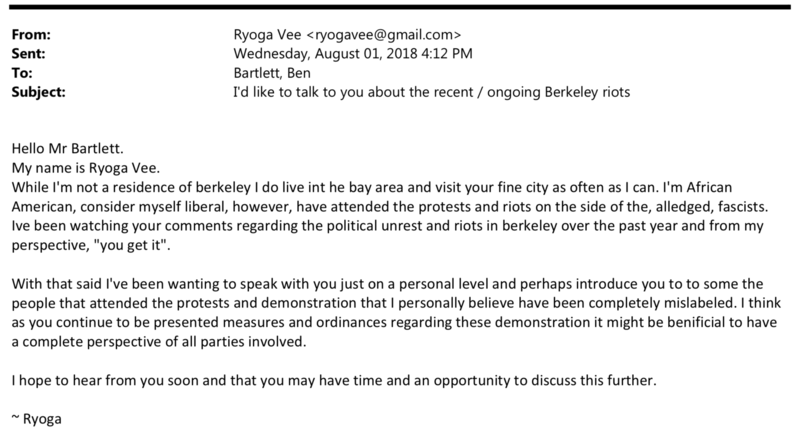 Vee chose to reach out specifically to the councilman because Bartlett’s comments about “political unrest” in Berkeley proved that he “gets it,” according to emails. What Vee was ultimately asking for was to introduce Bartlett to some of his friends who, like Vee, have been attending protests on the side of what Vee calls “the alleged fascists” for the last year and a half. The timing of Vee’s August 1 email is significant. 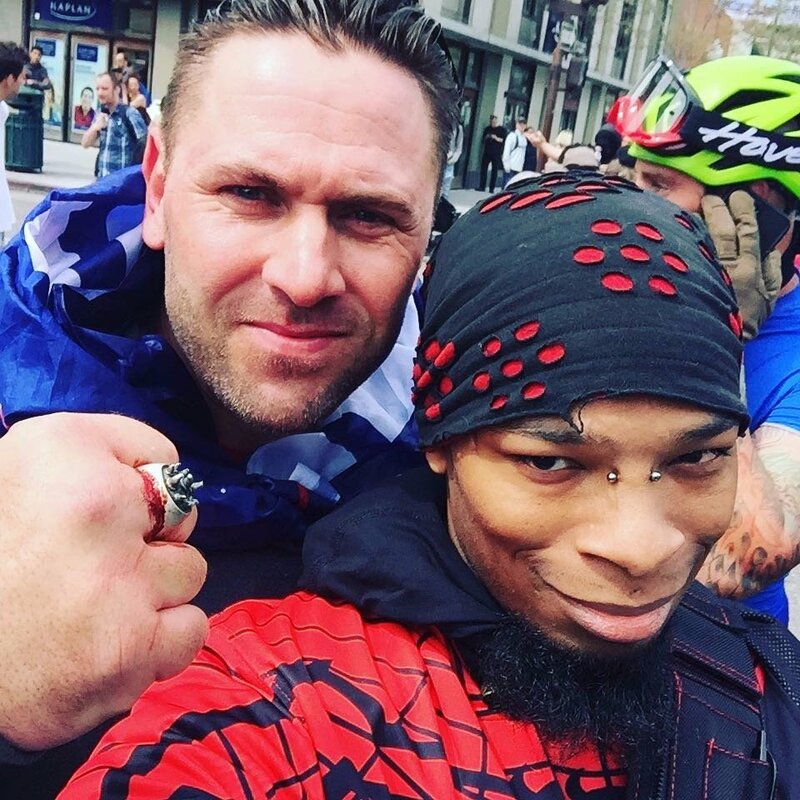 The Proud Boys, which Vee has a number of close associations with, had at the time been facing intense scrutiny for their violent actions and the hateful ideas that fuel them. For over a year, they’ve been assaulting people at rallies all over the United States, and the Proud Boys and Joey Gibson’s Patriot Prayer held their most violent Portland gathering yet on June 30. Shortly after, a false rumor started that the Proud Boys would be meeting at Make Westing in Oakland. The community began to organize a response and it was soon amplified due to anger over the racist murder of Nia Wilson on July 22. Following this, the Southern Poverty Law Center warned that the upcoming Proud Boys/Patriot Prayer rally in Portland on August 4 could be “another Charlottesville,” particularly concerning since the Proud Boys had been one of the groups in the middle of the right wing terror that occurred in Charlottesville, VA in August 2017. 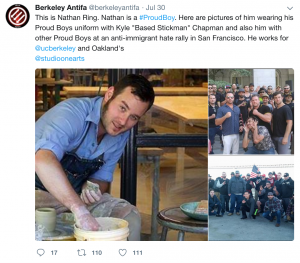 On July 30, just two days before Vee contacted Bartlett, Berkeley Antifa had alerted locals via Twitter to Nathaniel Francis Ring, a Proud Boy working at UC Berkeley and Oakland’s Studio One Art Center. It appears that Vee was working to create a counter-narrative to service the Proud Boys and alter the white nationalist group’s public perception. This wouldn’t be the first time Vee worked as a sort of PR for the Proud Boys. In December 2017, the Proud Boys described Ryoga as a friend doing a pubic service for his critical comments aimed at anti-fascists. Within two hours of getting Vee’s email, Bartlett responded and offered to meet in his office. 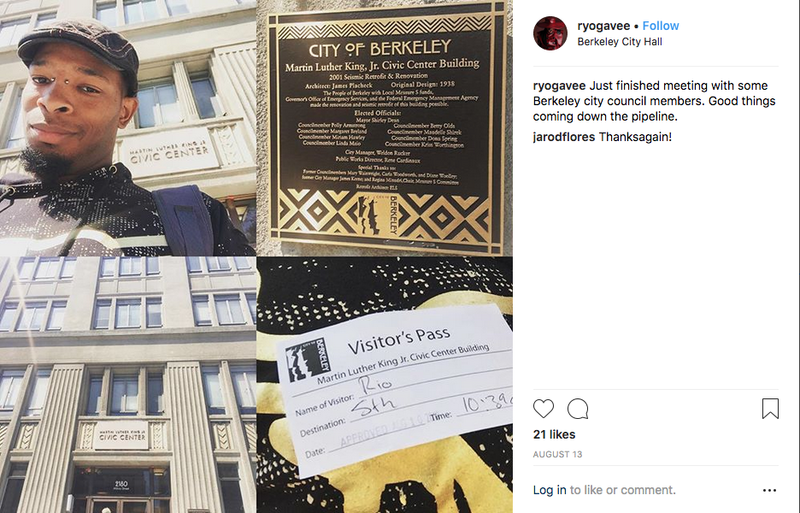 On August 13, Ryoga Vee brought Proud Boy Jarod Flores with him to meet Ben Bartlett in Berkeley at 10:30am. There is no record detailing the entire meeting’s discussions, but follow-up emails from the three participants and outside comments made by Ryoga Vee can confirm some portions of it. Ryoga Vee shared that he met with Berkeley council members and received advice on how to improve the Proud Boys’ public image in an August 18 livestream. Bartlett’s August 23 email to his chief of staff Olivia Cordis confirms he suggested the Proud Boys renounce racism, change their name, and create a positive mission statement. These issues directly address the intensifying negative perception that the Proud Boys began facing at the time. Emails also show that doxxing was of particular interest to the Proud Boys. 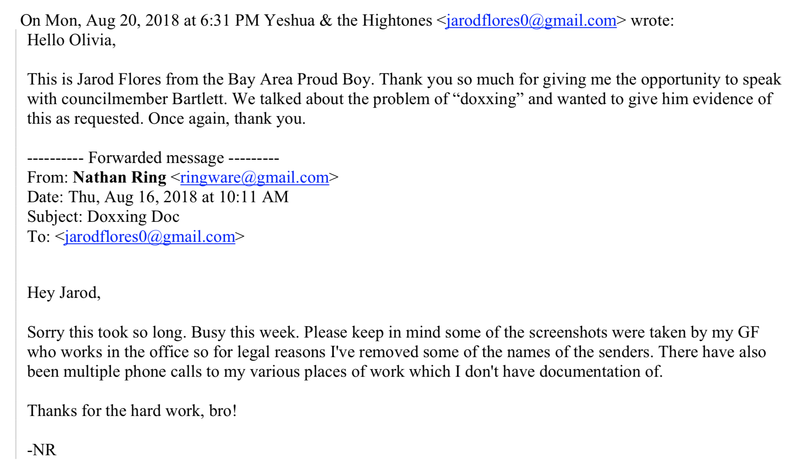 On August 20 Jarod Flores forwarded an email to Bartlett from Nathan Ring, the Proud Boy profiled in a Berkeley Antifa tweet, mentioned above. A later email to Bartlett from Vee included a link here to NoCARA’s website as it related to remarks made during the meeting. It appears that the local Proud Boys are beginning to fear facing some accountability for their actions and are turning to receptive ears within the state for help against anti-fascists. 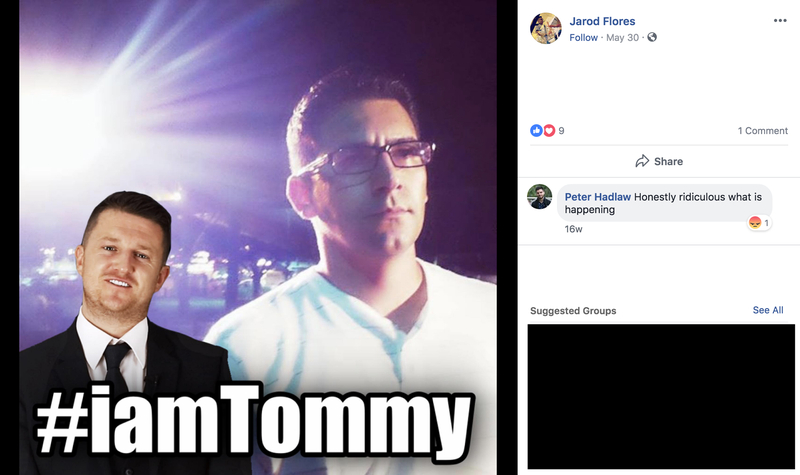 Jarod Flores is a leading member of the Bay Area Proud Boys. He has attended several far-right rallies and events, including the extremely violent Proud Boys gathering in Portland on June 30. Flores is also a member of the band Yeshua and the Hightones, based out of San Jose. The Proud Boys often point to the people of color in their ranks as some kind of proof that they aren’t racists. This is merely a smokescreen, and anyone that looks deeper into the group can see racism, homophobia, and misogyny are rampant within the organization. 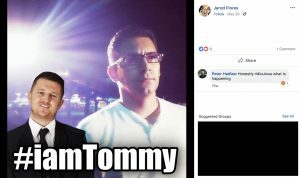 Levi Romero, a prominent Proud Boy of color from Southern California, has been recorded in videos using racist language and showing support for Nazis, who he calls his best friends. Romero has made multiple trips to Berkeley to harass the Left and anyone the Proud Boys deem undesirable. 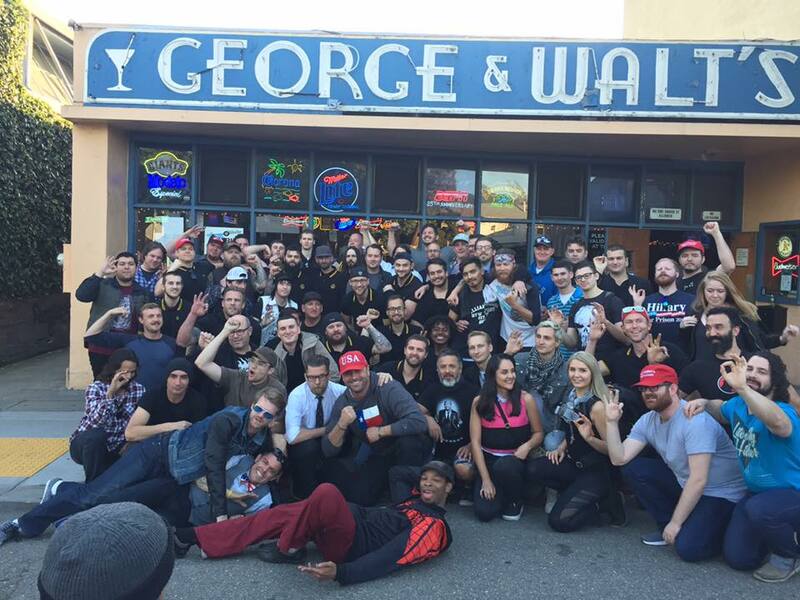 On April 27, 2017, Proud Boys leader and founder Gavin McInnes watched on as Romero and other Proud Boys beat on new recruits as part of an initiation process outside of the bar George and Walt’s on College Ave. In 2018, Romero and other Proud Boys were kicked out of a bar in Southern California and Ryoga Vee tweeted support for him, completely disregarding and ignoring Romero’s anti-black racism. 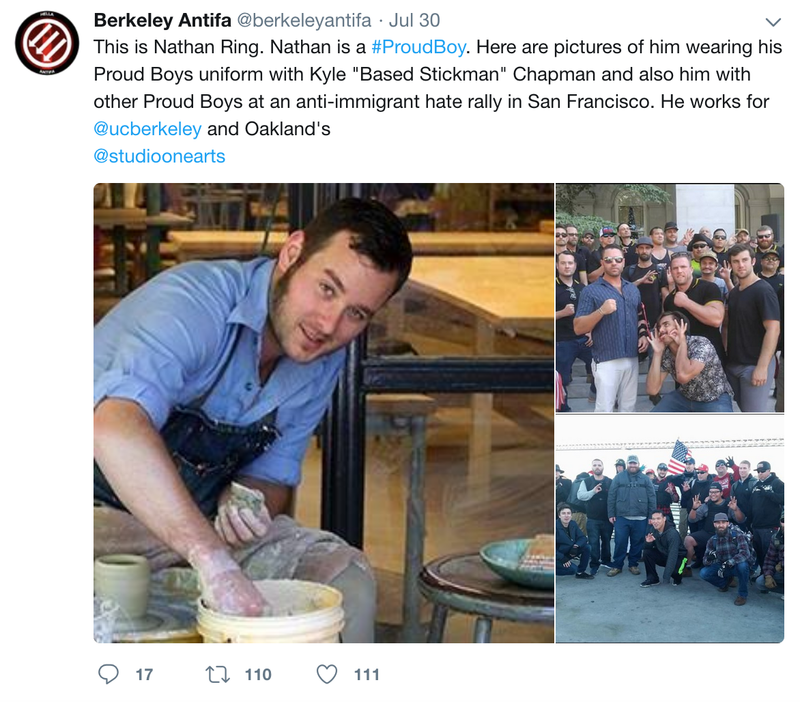 Ben Bartlett’s meeting with representatives for the Proud Boys and him providing them with advice with which they could further recruit is yet another example of the fascist creep in Berkeley. Both the Berkeley PD and University PD have consistently protected the alt-right at rallies and other showings. The Berkeley City Council created new policies that have given the police more power and weapons to target anti-fascists, and the police have ridden this wave of empowerment to aid the far-right to dox their opposition. Top authorities such as Berkeley mayor Jesse Arreguin and Chancellor Carol Christ have publicly advocated for people to stay home and allow the alt-right to organize and gain more power. On August 10, Twitter suspended accounts belonging to Gavin McInnes, regional Proud Boys groups, and even individual Proud Boys themselves. 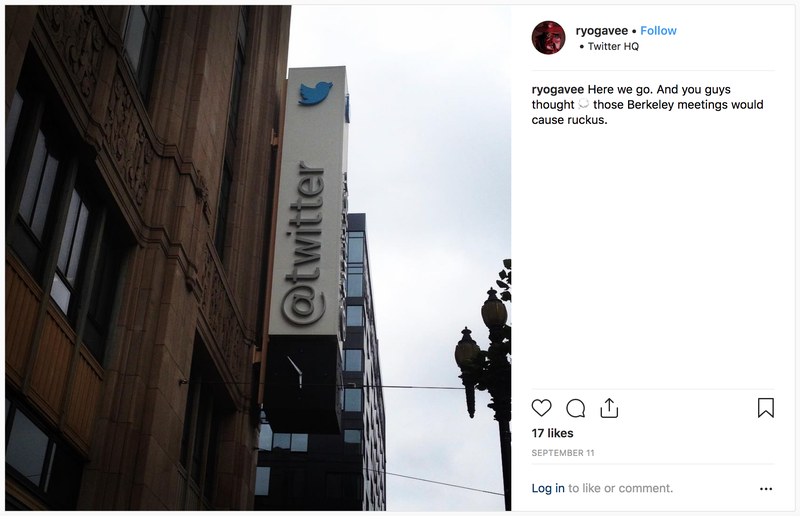 On September 11, Ryoga Vee posted to Instagram implying he was having a meeting with people at Twitter in San Francisco. Along with this heavy-handed repression of autonomous resistance to white supremacy, Berkeley and other Alameda County cities are planning a week-long series of events in November that they’re calling “United Against Hate.” Mayor Arreguin announced these events using images featuring the very movement he and his police force have spent the last year and half repressing, though the far-right has admitted that militant anti-fascism is the only reason we are seeing less public outings from them in Northern California.